Buffalo takes down the Penguins. All teams in the east that have to win seem to be doing it tonight. Devils/Sens going to a shoot out. Devils win on the sixth shooter. Marty ties Bernie Parent for wins in a season. Ranger$ lose in a shoot out. jagr can't pull the trigger to tie it. Tampa Bay jumped to sixth with that Ranger loss and a win tonight against Carolina. Johan Holmqvist did a great job goaltending. 3-0 since he was told he was their man from here on out. Tampa was down 2-0. Perrin makes it 2-1 in the second. Two quick goals from Vinnie and Danny Boyle make it 4-2. Lightning wins! Watched some of that Buffalo game during intermission. Now, they had two really quick goals in that game. Are they for real? Buffalo has been for real all year. And now Tim Connolly is back. Hey hockey fans out there just posting in with comments from Sunday Night's game at MSG. Had seats between the blue lines ~ 25 rows back. Thanks for great deal on the seats Hank Pipes. Yes the leafs lost (no suprise) but what an event the NY fans were top notch. We had a great time hanging with everyone, got to throw out some comments and caught a few back. Great time really impressed by the electricity in the building, the Potvin cheers, the Rangers chants after every goal. Sooooo much different then hanging out with the suits in Toronto. Everyone loved the Tucker Avery scrap. The standing O for the last minute was cool. And gotta say the ladies that were at the game were even better looking then the ladies at the Canucks games in Vanc. Awesome selection of beers and the food rocked. I think the Rangers are going far could be wrong on this and will depend on first round opponent but they looked great. Great mix of go to and character guys and good goaltending. Should be interesting. How could there possibly be a part 3? How could there possibly be a playoff game in Chicago before 2035? I watched that game Sunday, very entertaining. The Avery/Tucker fight was a good one. Hey Ron, you shouldn't pick on handicapped people. We suffer enough just being Chicago fans. But thanks for being optimistic. At least I have a chance of living that long. Although I think that Death Clock that someone posted had me checking out in 2034! Glad leafsfan had a good time at the game in NYC. Always fun to see a game in a different city. Too bad it wasn't a closer game. That was the first time I saw the Tucker vs Avery fight. That was weird. Did Tucker get an instigator? He should have according to the rules. Chasing a guy whose back is turned with the gloves already off. But he sure seemed suprised Avery skated away. I think Avery was playing games. Buffalo is very real. Well balanced and fast as hell. They sure as heck are! I have watched 4 or 5 of their games this year on the Versus or Sun channels. As Ron pointed out Tim Connolly is back. They're gonna be hard to deal with in the playoffs. Not only Connoly but Maxim Afinogenov also. He was their leading scorer when he went down. Even more firepower which is really pretty tough to stop. Defense is solid and Miller is great in nets. Should be an interesting playoffs. Would like the Sens & NJ to play 1st Round. Let them take care of each other. One less to possibly face. NJ will have to score more against Ottawa. No shoot outs in playoffs. Ottawa ran Brodeur out of the net earlier this year. That won't happen often but it shows they have the scoring to do it. You want to measure my WHAT? ANAHEIM, Calif. (AP) — Ron Wilson knows Teemu Selanne quite well, having coached him in San Jose and Anaheim. He's also been around the NHL long enough to recognize an illegal stick when he sees one. So the Sharks coach bided his time until the right opportunity presented itself to catch the Ducks' all-time leading goal scorer red-handed. An illegal stick penalty on Selanne negated an Anaheim power-play at the start of overtime, and the Sharks went on to beat the Ducks 3-2 in a shootout on Wednesday night. "I wasn't very happy about what happened," Selanne said. "Obviously, I didn't expect that call. Whether it was classy or not, it was Ron Wilson's decision. He's not my favorite coach anymore." Selanne used poor ice surfaces as an excuse for altering his sticks. "The ice is so bad in the NHL, you have to have that because the puck is bouncing all over," said Selanne, who had scored 537 goals in his career. "I'll bet there's a lot of guys that do, but you have to respect the rule." In the other NHL game Wednesday night, Washington beat Atlanta 3-2. Anaheim coach Randy Carlyle took full responsibility for the mistake and tried to deflect the blame away from his best player. "The issue of the stick is my fault, in the sense that I have to make sure that I reinforce and even go to a point where all the sticks are measured," Carlyle said. "I have to make sure that those things are not an issue, and they were tonight. It might have cost us a point, it might not have. But I'll accept the responsibility." Wilson, who coached the Ducks during the franchise's first four seasons, never shies away from gaining that extra edge — psychological or otherwise. "We had an inkling that his stick might be too wide," Wilson said. "When you look at it, it's almost the length of a goalie stick. I was just rolling the dice, and I figured I'd do it in the overtime and it worked." San Jose's Scott Hannan and Steve Bernier tied the score with second-period goals. Jonathan Cheechoo and Ryane Clowe connected in the shootout against Ilya Bryzgalov, who made 29 saves. The Sharks reached 50 wins for the first time in franchise history. Forced to use a regulation stick in the shootout, Selanne lost the handle on the puck as he approached the net with the Ducks' second attempt. Clowe beat Bryzgalov to the glove side with a short backhander, and the Ducks' Andy McDonald fanned on his shot at the other end. McDonald and Scott Niedermayer scored first-period goals for the Pacific Division-leading Ducks. They conclude the regular season Saturday night at Columbus before opening up the playoffs next week at Honda Center. The Sharks finished a combined 18-13-1 against Pacific Division opponents. They played their final road game of the regular season and ended up 26-14-1 away from HP Pavilion — the first time they've finished with more than 19 road wins in their 16-year history. After spotting Anaheim a 2-0 lead, Hannan got San Jose on the board at 7:57 of the second period with a slap shot from the right point while Bernier and Mike Grier were screening Bryzgalov. Bernier tied it at 15:42 of the period with a short-hander for his 15th goal, following a turnover behind the net by Anaheim defenseman Joe DiPenta. Anaheim opened the scoring at 6:19 of the first period, McDonald took a 25-foot wrist shot that sneaked between Evgeni Nabokov's pads for his 27th goal and eighth in 12 games. Nabokov made 37 saves, six in overtime. Niedermayer made it 2-0 on a power play at 14:01 of the period with his 15th goal, surpassing his previous career high set in 2003-04 with New Jersey when he won the Norris Trophy as the league's top defenseman. Bryzgalov got the start in place of Jean-Sebastien Giguere, who became a father for the first time early Wednesday morning. His son, Maxime Olivier Giguere, checked in 20 minutes after midnight local time, weighing 6 pounds and 8 ounces. Alex Ovechkin scored twice in the second-period at Atlanta, leading Washington to its second straight victory after six consecutive losses. Brent Johnson made 30 saves, surviving a Flames power play during the final 1 1/2 minutes — including a two-man advantage for the final 44.6 seconds. Andy Sutton had a short-handed goal and Ilya Kovalchuk also scored for the Thrashers, who remain one point ahead of Tampa Bay in the Southeast and host the Lightning on Saturday. Kovalchuk's goal was his 40th of the season and 200th of his career. Selanne uses a regular stick and loses control of the puck. That is priceless. Now we know why his last two seasons have been so good. The NHL's version of steroids - illegal sticks. Could be very costly for the Ducks. Could cost them first overall in the West and a slight but unlikely chance at the President's Cup. It has been nice seeing Selanne return to form though. I wasn't sure if last season was a last hooray for him. Guess not. Tonight's feature matchups for me. Toronto vs. NYI - Toronto will try to keep up with Mtl. and get rid of the NYI. Good game. MTL vs. NYR - Both teams really need this one. Playoff hockey for sure. Ottawa vs. Pitt - Sens can clinch 4th spot against the Pens and get home ice advantage. This playoff series starts tonight with a preview match. Calgary can claim the last spot in the West with a win. Don't think I'll be watching any games tonight. Derek has night one of tryouts for the Syracuse Stars Junior B team. I'm shooting some of the practice for the coach, who's a friend of mine. I guess he'll make the team. My wife couldn't be bothered to take Ken shopping for his trip to France & England. I had to do it today while working. Finished an hour AFTER we needed to leave for the rink. I'm not a happy camper and neither is Derek. The greatest goalie in hockey history broke Bernie Parent's record for wins in a season. Look out Patty Wah, he's only two seasons away from your record for most career wins. 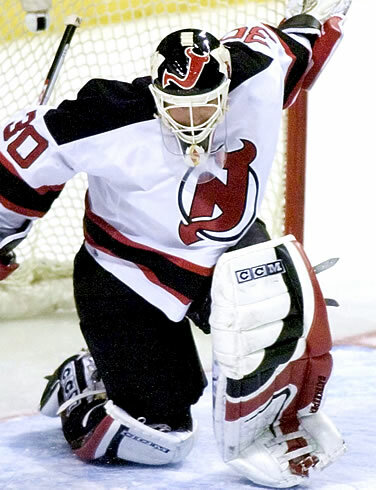 PHILADELPHIA (AP) — Martin Brodeur surpassed Bernie Parent, Philadelphia's stalwart Stanley Cup-winning goalie, for most wins in a season with 48 and the Devils clinched the Atlantic Division title with a 3-2 win over the Flyers on Thursday night. Jim Dowd scored a short-handed goal midway through the third period to lift the Devils to their franchise-record 49th victory of the season, surpassing the mark set in 1997-98 and 2000-01. They won their fourth straight game and second since Lou Lamoriello fired Claude Julien with three games left in the regular season and the Devils in first place in the division. Brodeur stopped 34 shots, including a breakaway in the second, to break the 33-year-old record in the city where Parent led the Broad Street Bullies to two Stanley Cup championships. While some retired stars want to see their records stand forever, Parent said before the game he was rooting for Brodeur. "This is his year," said Parent, his retired No. 1 hanging from the rafters. "He's played fantastic hockey. It couldn't have happened to a more fantastic individual." Sergei Brylin and Jamie Langenbrunner each scored power-play goals for the Devils. Jeff Carter and Simon Gagne had goals for the Flyers, who desperately need points in their final two games of the season to avoid going down as the worst team in franchise history. maybe I can go and boo. I'm so sorry for you, John. Man we could have some FUN pairings in the first round of the playoffs.